Hello there! How’s winter been treating you? Are you bombarded with snow? Or do you live somewhere warm and sunny? If so, can I come live with you 😉 ? Just kiddin’ (but kinda not kiddin’)….hehehe! We have been having snow around here like crazy. Like, just last week, over two days we had about 2 feet of snow with super high winds. So, suffice to say, I’ve been spending a little more time inside making all things comforting, like this spinach artichoke dip recipe. I don’t know about you, but I feel that if we are going to have snow, then have snow. Like, have a lot. Don’t have a little just to make a mess. Have enough so that you are forced to stay inside in the comfort of your warm house looking out at what mother nature throws at ya❄️? Years ago, living in rural Newfoundland, we would love to go sledding and in all kinds of weird places (not so weird as a kid). There was this field near my childhood home and that was pretty good (aka safe). But, we’d also go down hills with so many rocks underneath the snow that, when I think about it now, I must have been crazy!! Yeah, sure, go lightening fast down that monster of a hill dotted with rocks. Sounds like the perfect idea! #sarcastic. I even remember going down a steep street several times (yes, a STREET! ), on a crazy carpet, no less. Gee whiz – what’s better than rocks under ya? How ’bout some asphalt??! I guess as kids there is no fear. Now? Um, no thanks! I’ll stay inside, please and thank-you. Roughin’ it for me now on snowy days would be bundling up and walking to a pizza place to grab a pie to bring home?? Anywho – onto this spinach artichoke dip recipe, shall we?? Years ago, I remember having Spinach Artichoke Dip served in a big bread bun. Remember those? Well, this is a little twist on that, all served up in a cast iron pan. I said it before, and I’ll say it again, I think everything is better in a cast iron skillet. Love the rustic-ness of it; do you? Plus, I used fresh spinach, which practically makes this a health food. #SoNotTrue. For this recipe, I used fresh spinach, about 4-5 cups and the artichokes that I used were packed in water (not the ones packed in oil). If you rather not use the biscuits, simply place the dip in an oven safe dish and warm through. Serve with chips. A little squeeze of lemon is nice with this dip too, so feel free to give a little squirt and dig in! When hubby tasted this, his reaction was ‘Yeah, so, that’s going in rotation.’ If you wanted to skip the buns here, that would be perfectly fine. I’ve had this dip with my favourite tortilla chip and it works just as good. The buns just give the dip a little somethin’ somethin’, ya know? So, tell me, what was your favourite childhood winter activity? Has that changed now that you are an adult? Do you brave the cold weather? Or would you rather stay inside like moi? Hope you get a chance to try this baked spinach artichoke dip soon! And, if you do, I’d love to hear how you like it! 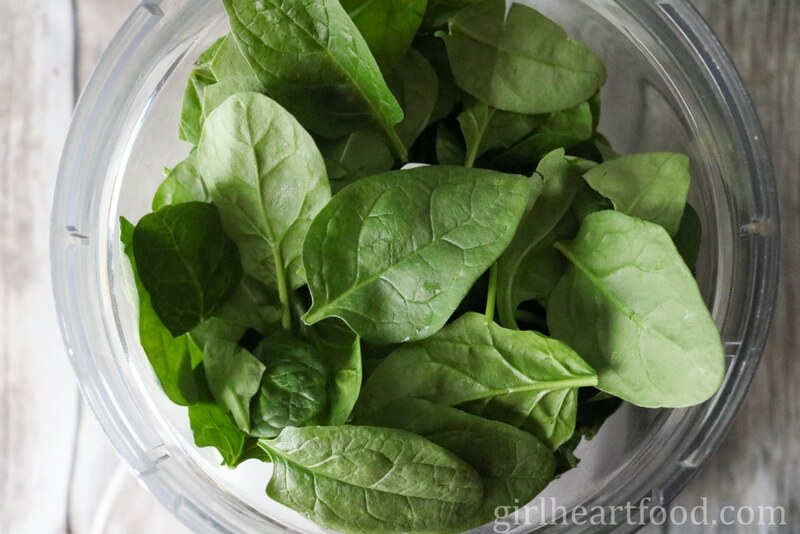 This Spinach Artichoke Dip is unbelievably easy to put together and tastes amazing! The pre-bought biscuits, while completely optional, adds a lovely touch and, plus, you have your bread and dip all in one! The prep and cook time is under 30 minutes and makes an impressive dip to bring to get-togethers. It's loaded with spinach, artichokes, cheese and a little spice and is sure to become your new favourite! Preheat oven to 350 F. In a food processor add spinach and blitz until broke down (few seconds). Add mayo, cayenne pepper, garlic, onion powder, nutmeg, salt and pepper. Blitz again until combined. Add cream cheese and blend until incorporated. Add artichokes and blend until few seconds until artichoke broke down slightly. Add 1 cup of the cheese and blend a couple seconds. Grease a 10 inch cast iron pan with PAM. Then, roll the buttermilk biscuits into balls and place in pan about an inch apart. Pour spinach artichoke dip in centre and top dip with remaining 1/2 cup of cheese. Bake for 20 minutes. Carefully remove pan from oven and turn to broil. Cover buns with foil and broil for about 2 minutes until cheese is bubbly. Carefully remove from oven and dig in! Lemon optional. Enjoy! Delicious! With the cold weather out there, this is one of those amazing snacks to eat while watching Netflix 🙂 Thanks for sharing! Oh my gosh that cheese photo is making my mouth water. YUMMY. Yeah, I am an LA girl, and the weather has actually been raining a ton, but none of the white stuff! I think I’ll take the rain over the snow, but sun over it all 😉 Thank you so much! Hope you’re having a fab weekend, Cindy! This winter feels like it is never ending – I wish I could live somewhere warm or at least escape to somewhere sunny for a week or two. It has been grey in grey for days now and I just can’t wait for spring. Snow would be nice – it looks so pretty but unfortunately, we have rarely snow here in London and if we do nothing works anymore, everything just comes to a standstill 🙂 Your spinach and artichoke dip is just the right thing for these days – perfect comfort food and I love the ideas of making the dip with buns! Delicious! I totally know what you mean, Miriam!! Won’t be much longer and spring will be here, thank goodness 🙂 Thanks so much for the kind words! You’re making me hungry, Dawn! There ‘s still some time to go before dinner, now I need to eat something 😉 . This spinach artichoke dip looks so yummy, and I’m with you, love the biscuit touch! Stay warm, here in Canada, it has been not too bad, no snow and warmer temperatures. As for me, growing up in Rome, not much of a winter there, so the most dangerous activity, maybe puddles?? 😉 . Pinned! Haha! I hear ya, Nicoletta 🙂 Newfoundland definitely has it’s own unique weather. People joke that sometimes we get four seasons in one day, lol 😀 And, funny thing, other parts of Canada is not so bad. Oh well, right? Going to have to see those puddles one day in Rome. Would absolutely love to go! Thanks so much for the lovely comment and Pin! Have a wonderful upcoming weekend! Can’t say if I had a special winter memory living in San Francisco, but we’d always ride our bikes through Golden Gate Park or hang out near the beach, which did not necessarily mean it was warm, just windy has all get out. Now Spring, that is my favorite season, especially with all the new growth of flowers and nature in general. Which brings me to this lovely green spinach artichoke dip. LOVE the idea of the rolls baked alongside in the pan and topped with cheese – heavenly! This is a great one! Hold up…you used a carpet for snow sledding? Like really a carpet? Wouldn’t it get all wet and heavy? I’m confused because I grew up in Florida and have no idea what the funk you are talking about with snow and winter and such. My favorite winter activity as a child was doing the same thing I all the other “seasons” of the year: going to the beach, riding my bike, and swimming. And I used to watch TV shows where they would show snow up north and I would say “I’m glad I don’t live and will never live where it snows like that!” Karma got me in the end because now I live in the cold north and am counting the days until I can move back down south and never experience a snowy winter again! YAY!!!! 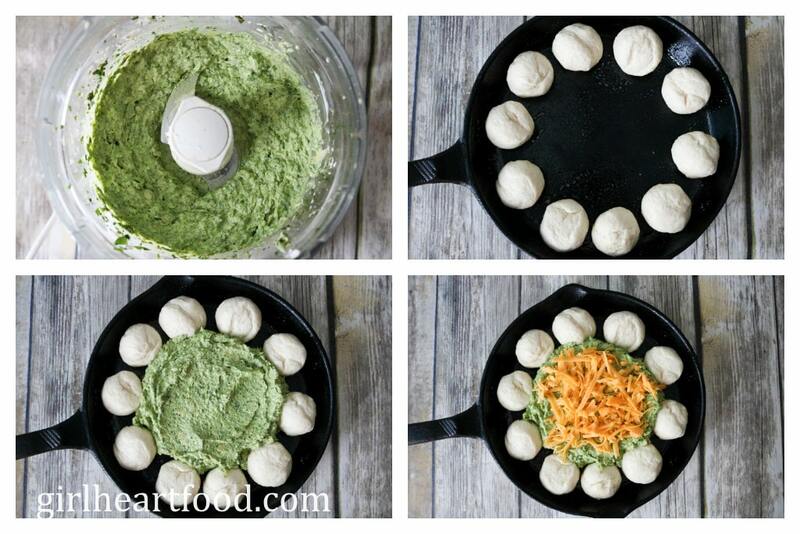 The biscuits combined with this dip look so good – I just want to pull apart a piece and dip it into this dip yumminess! I’ve always loved spinach & artichoke dip. I read your sentence about 2 feet of snow and had to click on your about page immediately to see where you live. Whew, that’s a lot of snow!!! I agree that if it’s going to snow, it should go alll the way and give me a blizzard, so I have a good excuse to stay home in my pajamas! 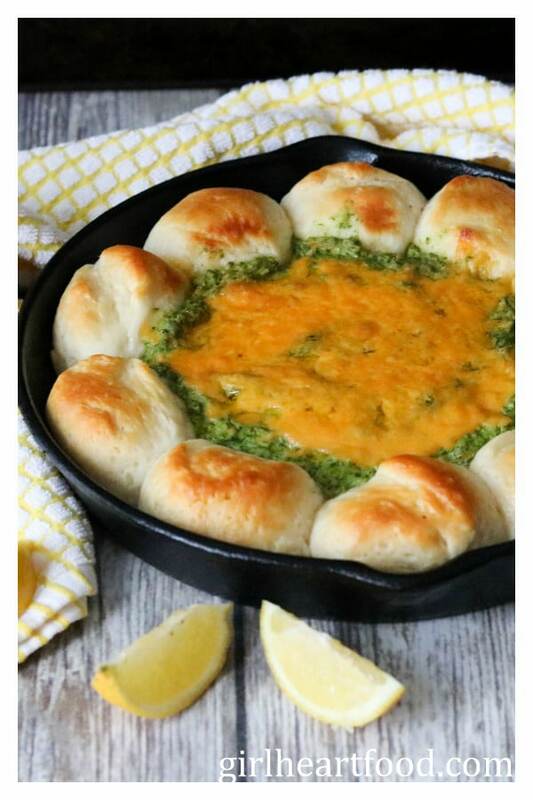 I’m obsessed with this dip… I loveee that the bread and dip is all in one 🙂 Perfect for eating in my pajamas while there’s a snowstorm outside! Thank you Sues 🙂 !! I totally want to cannonball into this dip! It’s been crazy warm here and I’m not complaining. I want to sit on my patio with some of your dip and a cocktail! These are my favorite dip recipes! Love that the bread bakes right in the pan, and that dip itself? Girl, I’m drooling already. NEED this in my life! Amazing recipe, Dawn! I would love to have this spinach artichoke dip for Sunday’s lunch! I’ve totally been thinking about this dip since last night when I saw it on Instagram! Yes, I fell asleep thinking about this dip last night. And I’m not ashamed about that at all. Haha! But back to childhood adventures. We used to live on a really steep street, and the one time we got a lot of snow (hey, this was in the southern US…it doesn’t snow much), we went down that street on sleds at least 76 times! The worst was having to drag your sled back up to the top. Haha! I love that your idea of roughing out now involves bundling up and heading to the pizza shop. That sounds about like me! 🙂 But next time, my idea of roughing out will involve this dip. It looks insanely good, Dawn! Love the biscuit touch. And I love that you didn’t burn the biscuits either. Hah! Hahaha! Happens to me all the time, David! Too funny 😀 Oh, yeah, going back up the hill. Forgot about that! That was the worst part, but going down? Woo hoo! It’s no wonder I’d be hungry after sledding all day, lol! Nope, no burned biscuits here 😉 Thanks for the kind words, my friend. So happy you like the recipe! Hopefully, you’ll get a chance to try it soon! This is my favourite dip to order at restaurants. Yum. The bread around is a lovely touch. Double yum! This is definitely something I’d want to gobble up on snow day (or any day!!). We haven’t gotten a lot of snow this year (knock on wood) though the temperatures have been horrendous. Though we’re almost into spring. Almost! Happy Monday! You should try this one! Easy peasy! Lucky you with not a lot of snow! Can’t wait for spring either, especially the change in wardrobe, lol 😀 Happy Monday to you too! Spinach artichoke dip is one of my favorite things, and I’m loving the way you baked it with those biscuits! So amazing – need this! With two feet of snow, I would have stayed in in my comfy, cozy clothes and made this yummy dip too Dawn! It looks crazy delicious! I love the biscuits around the edges. Such a pretty looking appetizer for company! Pinning and can’t wait to give this one a go! Definitely so much better than venturing outside! Thanks Mary Ann! I hope you enjoy this one 🙂 Stay warm and cozy! Yeaaaa, sledding with rocks or asphalt underneath the snow? I’d pass on that now too. And I’d love to think I wouldn’t have done that when I was younger, but who am I kidding? I’m sure I would have. lol It’s not really cold or hot here in NC. It’s somewhere in between, which it’s great if you ask me. You should come visit!!! But make sure you bring this dip! 😉 I LOVE me some spinach artichoke dip – soooo creamy dreamy! And this looks amazing! I’m going to go ahead and say those biscuits should NOT be optional. They are a requirement in my world! Gimme all the cheese and carbs! Cheers girlfriend! I know….crazy, right? So funny now when I think about it. Though, I did have my fair share of tumbles. Lucky you with weather! I would definitely bring ya some dip, Cheyanne 🙂 Have a great week! Cheers! The weather has been unseasonably warm here the past week, and will be this week too..in the mid to upper 60s! That’s super warm for Chicago, but I’m not complaining. Bring on the spring weather in winter, right? 🙂 I hope the cold and snow gets a little better for you. i’m sure my area will get hit with that again before spring arrives. But, as long as I have some of this dip, I’ll be one happy girl. Love how you presented this, Dawn! Those biscuits and cheese are really calling my name. I think I could eat this ALL for dinner! Pinned! Hope your week is off to a good start! So true! Bring on the spring weather in winter…I’ll take it 🙂 I think I could eat this all for dinner too, Gayle! Appreciate the kind words and Pin, my friend! Have a wonderful week!